For Information Only. Product is NOT offered. ✔ The Ultimate Hair Regrowth Solution: DualGen-15 NO PG Plus is the most powerful solution available for fighting against hair loss that is usually only available through hair regrowth clinics. ✔ Two FDA Approved Ingredients in One Solution: Include the maximum strength of FDA approved hair growth stimulator Minoxidil and DHT blocker Finasteride (0.1%) with other auxiliary ingredients such as Azelaic acid (5%), Retinol (0.25) and Caffeine. ✔ No Need to Buy Finasteride Pill: If you are currently taking 1mg finasteride pill a day, you don't need to continue to take the pill if you use this topical solution. 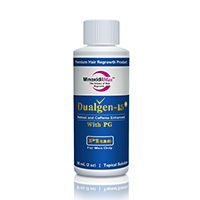 ✔ Who Should Use DualGen-15 NO PG Plus: This product is intended for men with advanced hair loss. It is most suitable for those who used Dualgen-15 NO PG for at least four (4) months without satisfactory results. ✔ Skin Friendly: Free of Propylene glycol (PG, or PPG). PG is the culprit that cause scalp irritation seen in most other brands of minoxidil products. If you have any questions regarding topical finasteride, please read here. Using the included dropper, apply up to 1 ml of DualGen-15 NO PG Plus to your scalp in the hair loss area in the evening. Once a day should be sufficient for most people. It can be used in conjunction with lower strength solution such as our EssenGen-6 Plus, DualGen-5，or Essengen-5, in which case use low strength product in the morning and DualGen-15 NO PG Plus in the evening; using each product once daily. If you do want to use this product twice daily, please do it only after it is proved that once a day is not effective enough and you have no side effects to use it twice a day. Use no more than 1 ml each time. You only need to use enough to cover your balding/thinning area with a thin film of the solution. You can use your finger tip or the tip of the dropper (included) to spread the solution. Try your best to apply the solution directly to your scalp by parting your hair. Otherwise you end up with wasting the product on your hair and it takes long time to dry. WANT TO KNOW MORE ABOUT 15% MINOXIDIL? If you have any questions regarding 15% minoxidil, please read the FAQ section of Dualgen-15 NO PG. Please be advised that there are two versions of Dualgen-15 Plus: one is DualGen-15 NO PG Plus, the other is DualGen-15 With PG Plus. A. 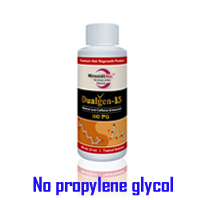 If you are not allergic to propylene glycol, it is recommended to use DualGen-15 With PG Plus that is slightly less greasy than DualGen-15 NO PG Plus. B. If you would like to buy this product without finasteride due to the concern over the possible side effects caused by topical finasteride, please check out Dualgen-15 NO PG. If you never used our Dualgen-15 NO PG (free of finasteride), you are recommended to try Dualgen-15 NO PG first. 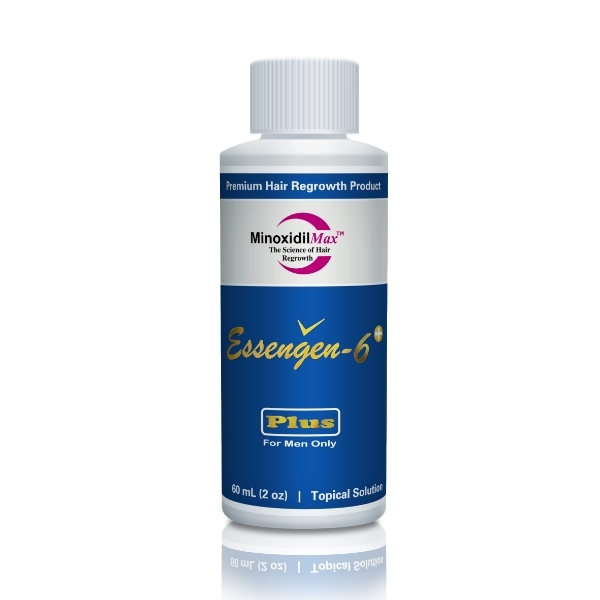 If you want to have a product that has topical finasteride without minoxidil, you can check out Essengen-F.
Not sure which product to choose? please see the product comparison page.